I love grapefruit juice in cocktails. Whenever I go to Locanda, one of my favorite restaurants in the city, instead of ordering off the cocktail menu, which is fantastic, I always seem to get the incredible bartender there to make me “something special.” When he asks what flavor notes I enjoy, I find myself always bringing up grapefruit. Ever since I had my first greyhound years ago, I have loved the combination of grapefruit and vodka – so refreshing without being overly sweet. 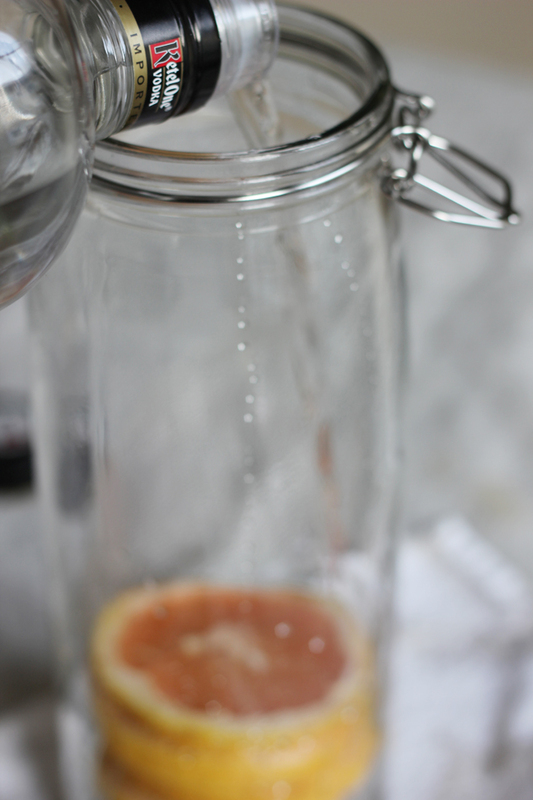 I decided to make a grapefruit-infused vodka a few weeks ago, and it couldn’t be simpler. Having a bottle of this around is bound to liven up any cocktail party – it is excellent in a Venetian greyhound, regular greyhound and makes even a vodka soda more exciting. 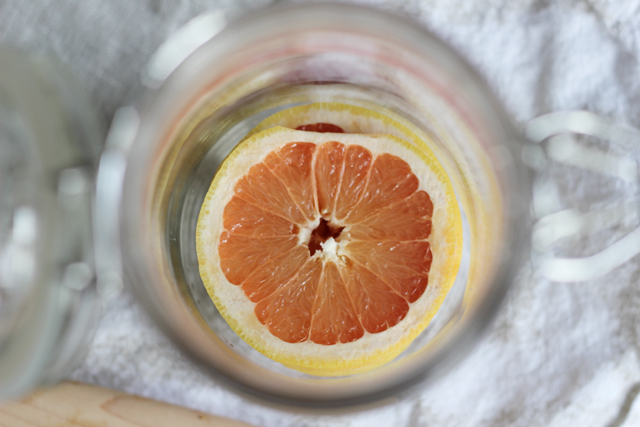 Step 1: Slice grapefruit into small enough slices to fit into a sealable jar. I used a ruby red grapefruit because I love the color. Step 2: Pour vodka over. 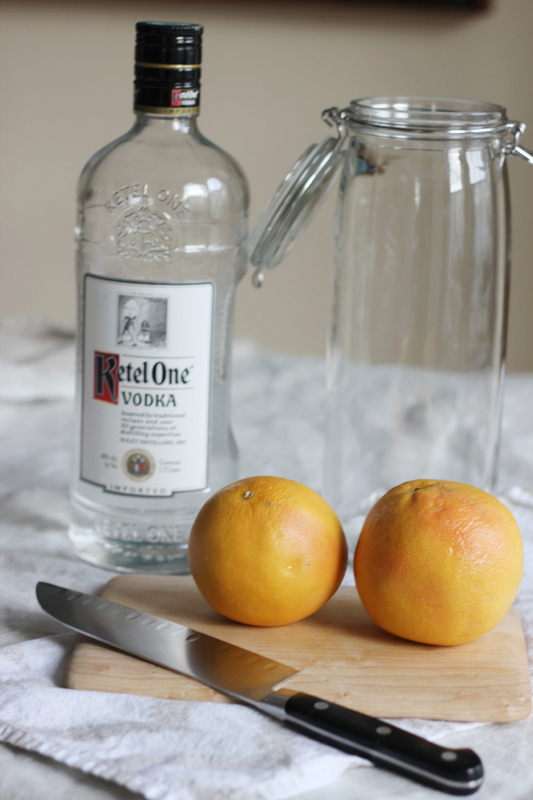 I used Ketel One vodka, but use your favorite good quality vodka. Step 3: Let sit for at room temperature for 4-6 days, or until desired amount of “infusion” is achieved. Step 4: Pour vodka into fine mesh sieve to strain out grapefruit pieces and store in air tight container. Step 5: Bring a bottle of this to your next cocktail party and knock the other guests’ socks off. That’s a great idea! Really simple too. I love infusing vodkas. 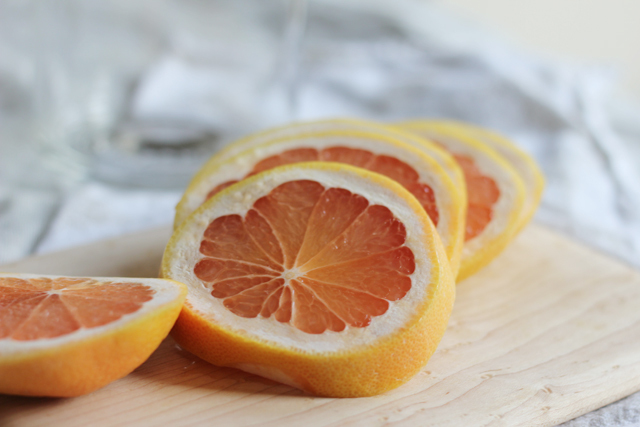 This would be perfect where grapefruits are in season. 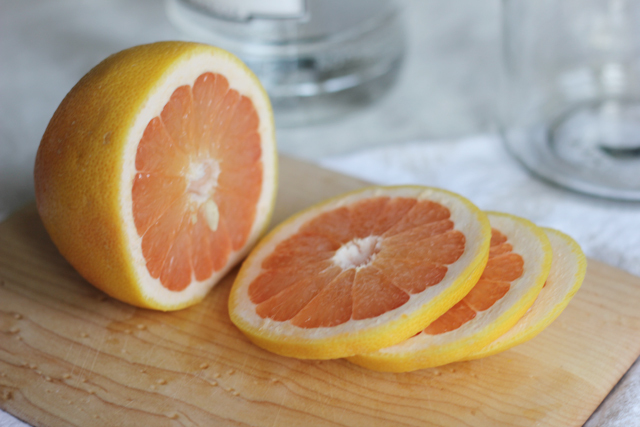 I love grapefruit in drinks or cocktails and your infused vodka couldn’t be easier, What a great idea! This goes for grapefruit, pineapple and my favorite PEAR!!! I have a 3 gallon mason jar with spout to make this in but wondering why I need to take the grapefruit out? All of the infusions I’ve had were always displayed in the beverage jar with the fruit in it. Isn’t that part of the beauty? Hi Bonnie. I think that as long as you consume the infused vodka soon after making it (probably no more than 2 weeks) it should be fine to leave the grapefruit in. However, I am not sure whether it would continue to flavor the vodka over time such that by the end it would be overpowering….I haven’t tried it though so I would love to know what you think! Wonderful – so great to hear Brian! Thank you so much for stopping by!